A padeye is a device often found on boats that a line runs through, or provides an attachment point. 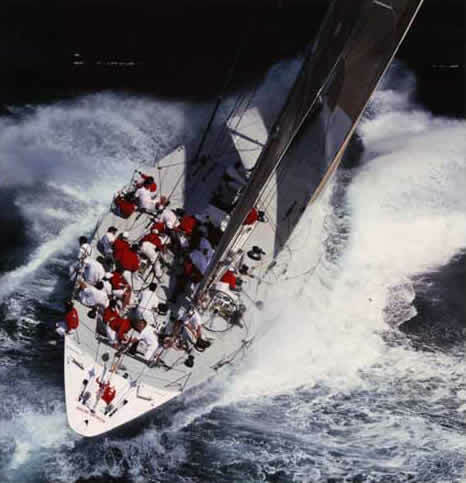 It is a kind of fairlead and often is bolted or welded to the deck or hull of a boat. Pad eyes are eyelets, rings, or loops that attach to machinery or equipment. 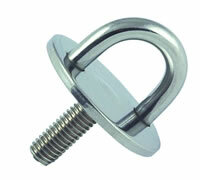 They can be used for tie-down, lashing or securing applications, but are not usually rated for overhead lifting. There are many different types of pad eyes. Examples include pad eyes, pad eye diamond investment cast polished, pad eye diamond stamped welded, pad eye oblong investment cast polished, pad eye oblong stamped welded, pad eye round with threaded stud, pad eye round, pad eye square stamped welded, pad eye with ring stamped welded welding ring pad eyes, folding pad eyes, eye straps, and anchor plates. Welding ring pad eyes have a diamond, square, oblong, round or saddle-shaped base that maximizes load distribution. They are cast or stamped and made of stainless steel. Pad eyes have 2, 4, or 6 holes. Investment Cast Pad Eyes - These heavy-duty pad eyes are investment cast from high quality 316 stainless steel for a high degree of accuracy and strength. The first step in this process involves making a wax part from a master or permanent die. The wax part is then used in a temporary or series of temporary moulds. The actual parts are then cast from the temporary moulds without any wear to the permanent die to ensure accurate castings each time. Welded Ring Pad Eyes - welded pad eyes are fabricated from 316 stainless steel rod with stamped bases. Thick diameter rings and welded construction provide high strength and durability. Investment casting, is one of the oldest known metal-forming techniques. The castings allow the production of components with accuracy, repeatability, versatility and integrity in a variety of metals and high-performance alloys. The process is generally used for small castings. It can produce complicated shapes that would be difficult or impossible with die casting, yet like that process require little surface finishing and only minor machining. Investment casting is used in the Marine Industry to produce many marine fixings and fastenings. Investment casting offers high production rates, particularly for small or highly complex components, and extremely good surface finish with very little machining.